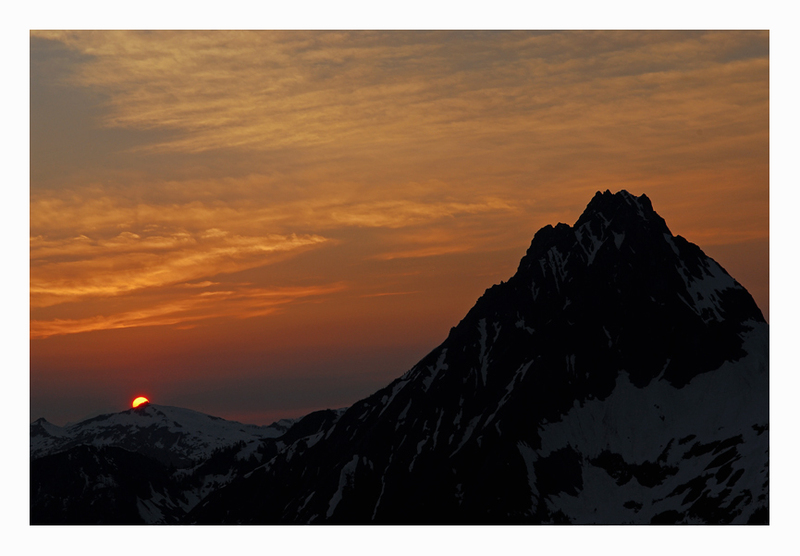 The Ptarmigan Traverse has some history with me. In 2005 with no ready partners, I decided to make a hike, climb, kayak and bike trip out of a classic. My ultimate goal was to see the area in potentially calmer summer conditions than a winter or spring adventure would likely entail. That way I would have familiarity with the area in case of deteriorating weather. 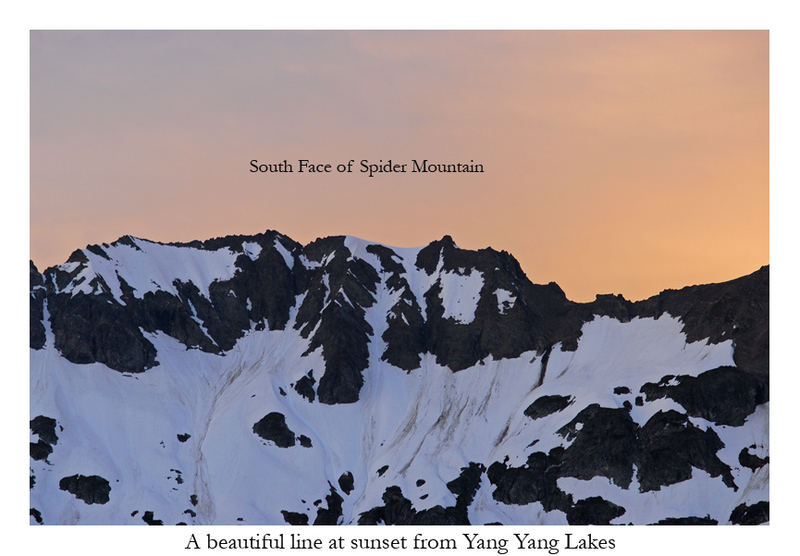 I had made 3 ski trips into Dome Peak and vicinity via Downey Creek and 3 others into Spider Mountain and area with limited success. I had no doubts in my abilities to escape via either of these routes and now that I had tied the entire traverse together in my head, I wanted to reach a little further into my imagination and try for an adventure more daunting, something I had been dreaming about and agonizing over for many years. 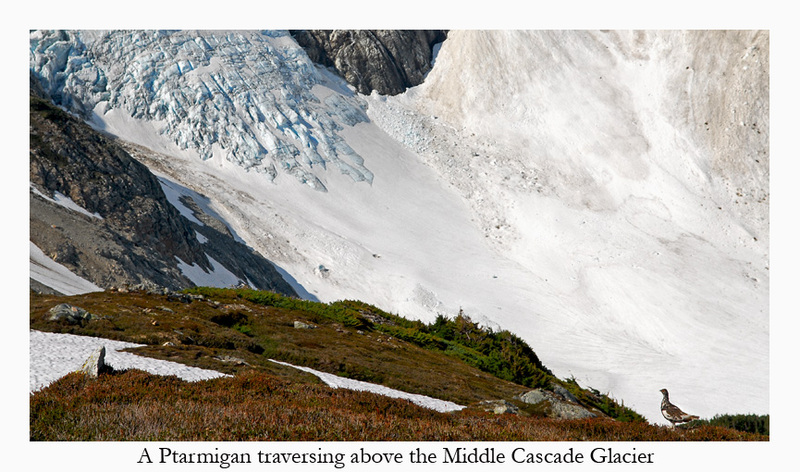 A ski traverse of the Ptarmigan is a feat in and of itself. This was pushed to its limit when brothers Lowell and Carl Skoog linked the entire traverse together in a 24 hour period. 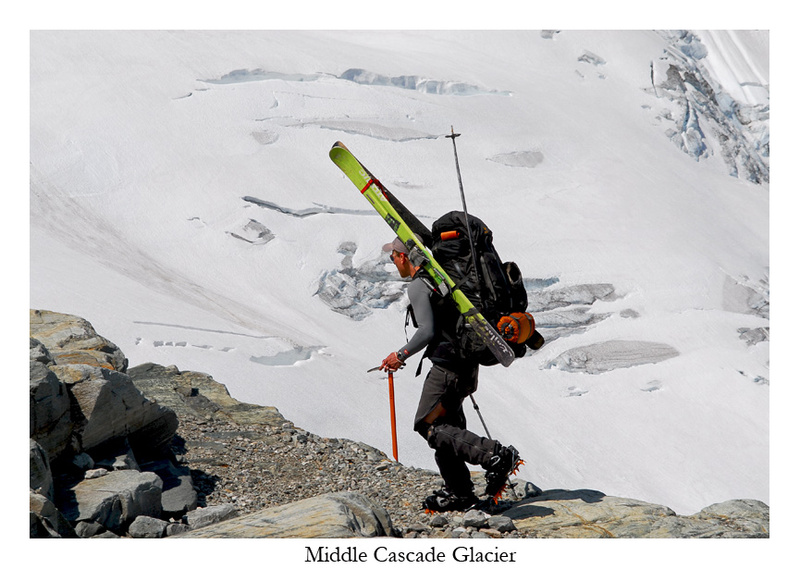 Carl had also returned in later years to ski several peaks along the way. My ultimate satisfaction with any traverse is found when I can combine both traversing and descents. 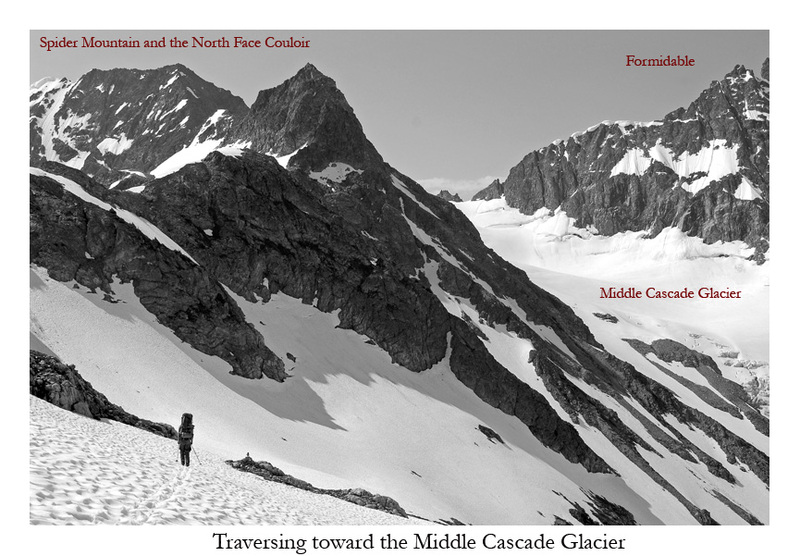 There is no better way in my opinion to tie together peaks, glaciers and ranges in one's mind. In 2007-2008 many floods had impacted the roads leading to and from the Ptarmigan. Not one to give up so easily, I researched alternative entry and exit routes. Nothing really matched with what I was searching for but I was willing to compromise. As June neared I was prepared to go, but Mother Nature was not. She continued to lay down snow and produce weather very unique even by Cascade measures. Our spring was one for the record books in both temperature and snow. 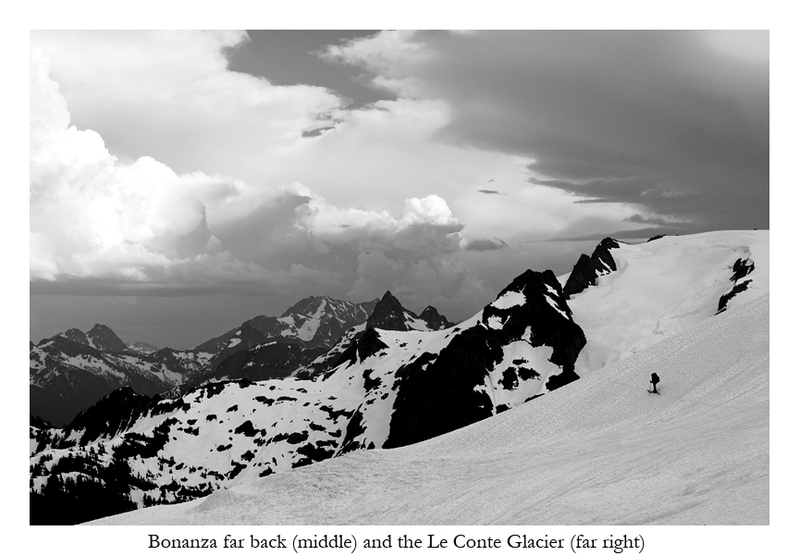 In my quest to ski every imaginable thing in Washington, I went into Fortress Mountain in the hopes of seeing certain faces and lines I ached to ski. Instead I was offered fog and during the descent the mountain caught off guard just below its summit. In my lapse I broke loose a large slab avalanche which carried me into the unknown down a steep 40+ degree aspect I had not seen. More about that in this trip report. It is mentioned here because, in events like these, at least for me, I take some time to get my head screwed back on straight. This was not good timing, as five days later I was to be on the Ptarmigan and there was still much planning to undertake. It was exciting to bury myself in maps and plan strategies. 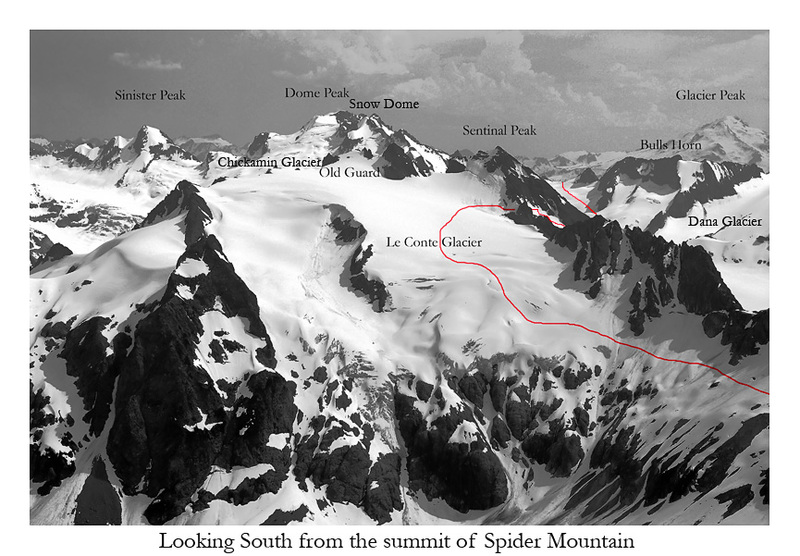 What I came up with was to extend the traverse to Lake Chelan and drop to the east of the crest rather than west. 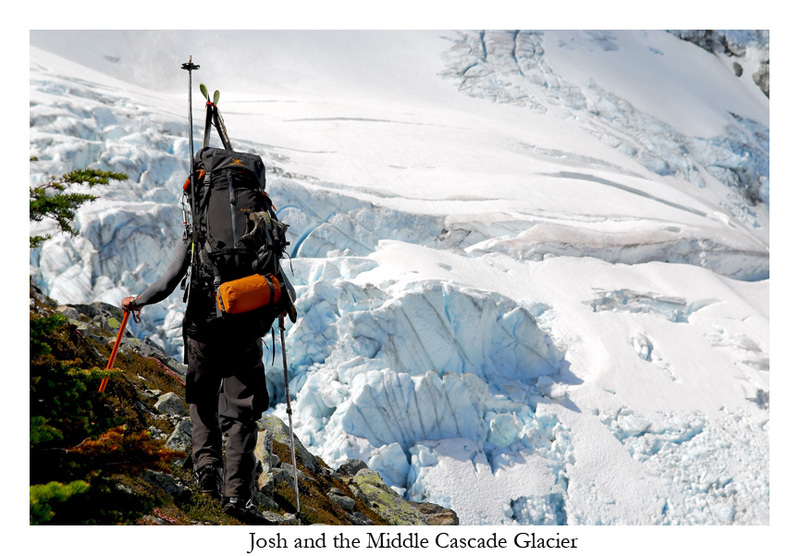 Not only did this extend the traverse over several more glaciers, but it also led me into areas I did not know. Mystery is quite a beast made bigger and meaner, taller and fiercer, uglier and scarier than maybe it really would be if it were a known variable. But I like that. With an open architect that I feel is most advantageous on such trips, I kept in mind routes down Agnes Creek, Spruce Creek and the Hanging Gardens. Every peak along my route was on the chopping block. Any or all wouldn't be enough for me, but realistically I knew I'd be lucky to get away with a few. After weeks of waiting a forecast that dreams are made of was finally offered to the faithful. My brothers and I had been keeping an eye on it for weeks and had finally pushed our vacations for the last time. If we were to go on a trip together, this week was it. 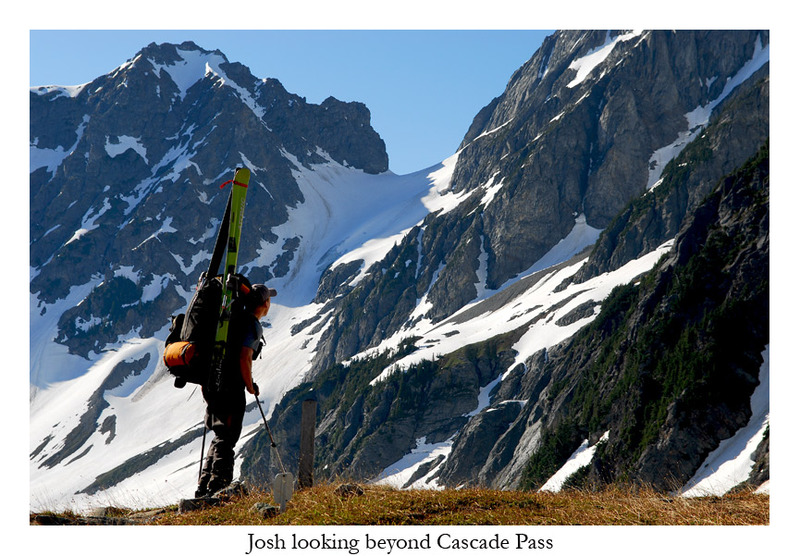 For years I'd wanted to bring my little brother Jessy and twin brother, Josh on a ski mountaineering trip into the North Cascades. But getting all us together had all but gotten harder as the years slipped away. 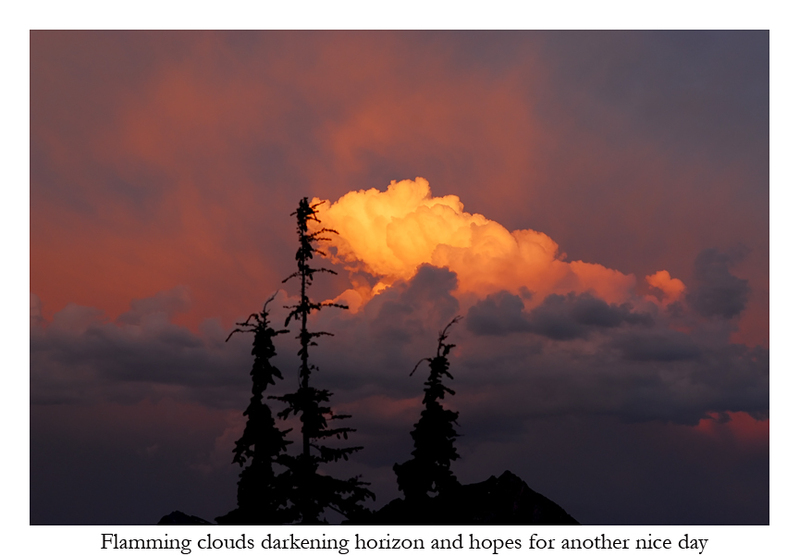 Finding little yellow suns spread across the screen were as good as gold after so much waiting, but hints of thunder and lightening storms toward the end of the week were hoped to be imaginings of the forecaster, such as I'd seen reported on in the weeks prior. Years for that matter! 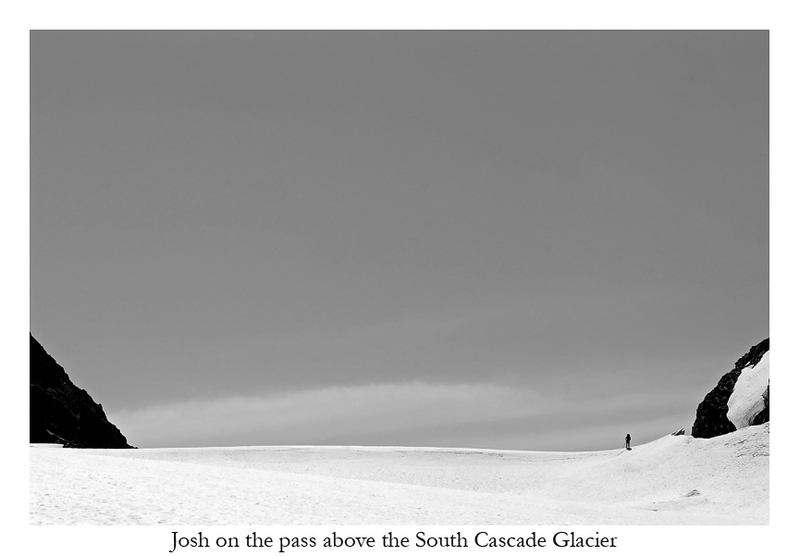 It required a full day to park cars in Chelan and Cascade Pass, for my brother to drive from the Spokane area and Josh and I to drive from the Tacoma area. We procured tickets for the boat. For those who don't know, the Lady of the Lake’s (there is more than one boat) are the only way to get from one end to the other, servicing the communities and tourists who live and venture up its nearly 60 miles of length. It was past 11pm when we arrived at the Eldorado Trailhead. Possibly just the day before road work had repaired the road and allowed us to drive much further than expected. Not long after I slipped into sleep, already exhausted. We had decided on an early start and were on our way by 4:30am. This was done to avoid the high temperatures expected, especially on the traverse over to Cache Col, a steep slope hanging over cliffs below Mix-Up Peak. Massive Packs weren't heavy enough to dull our moods and I was satisfied that we were finally here. In a sense, it felt like all the hard work was done and now all I needed to do was put one foot in front of the other. This was not the case, of course. By trip's end I would've put more effort into this trip than any other ski mountaineering venture I'd done to this point in my life. This could be blamed on my way of thinking, which often is bigger than should be advised. I kept imagining a peak plethora of ascents and descents. I brought everything to get up them: rope, harness, safety gear, shovel, extra binding parts (including an extra binding! 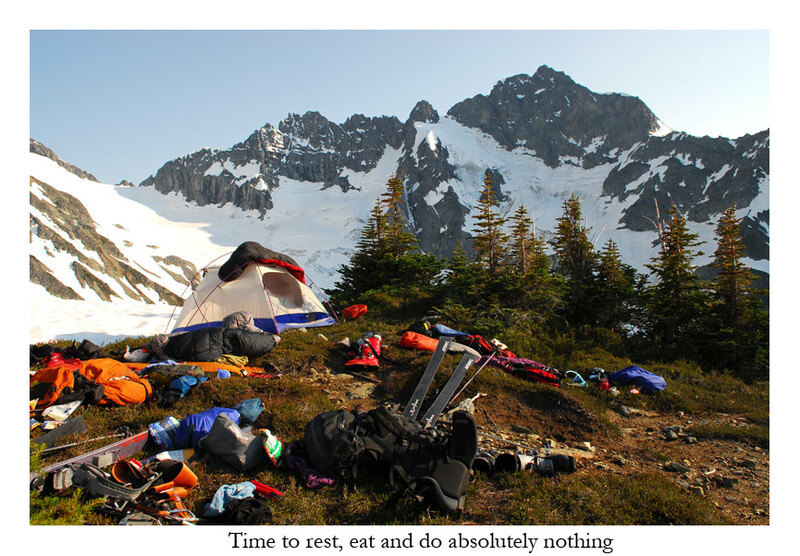 ), avalanche gear, crampons, ice axes, 4-season tent (could survive anything), extra pack (we would be dropping gear and I couldn’t think of a way to summit mid-day with skis without) and of course ski gear. It would be foolish to forget the extra food I brought as we really were far from anywhere if caught in weather and forced to stay put or reverse course cause of our inability to ford any number of creeks and rivers that stood in our way. Because of my increasing enjoyment with photography, I also carried 8lbs of camera gear. All tallied my pack weighed 95lbs, Jessy's was 98lbs and Josh’s was around 80lbs. I had enough gear for a healthy 11-12 days. If you think I carried too many clothes or whatever, you are wrong. My gear was what weighed me down. Take away my camera and ski gear and you can take away almost 30lbs. 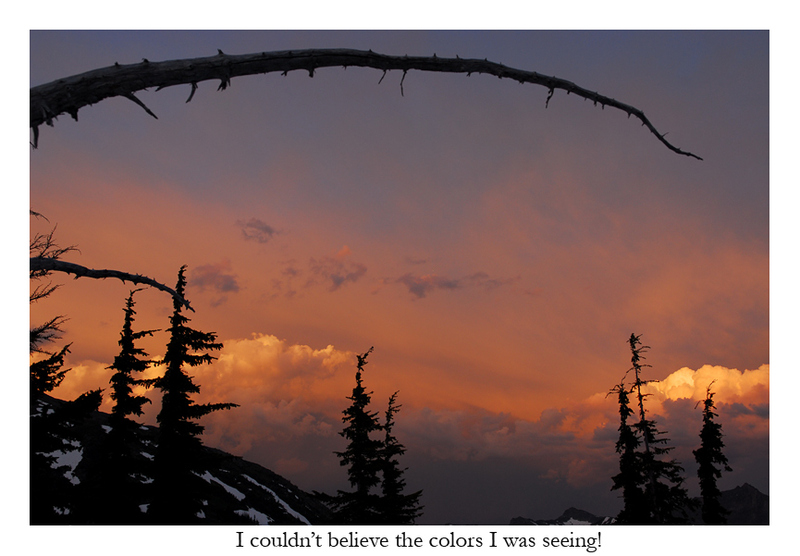 Branches acted like paint brushes above the green shielded road onto its canvas of blue above. After 3 miles we broke out of the trees onto the end of the road. 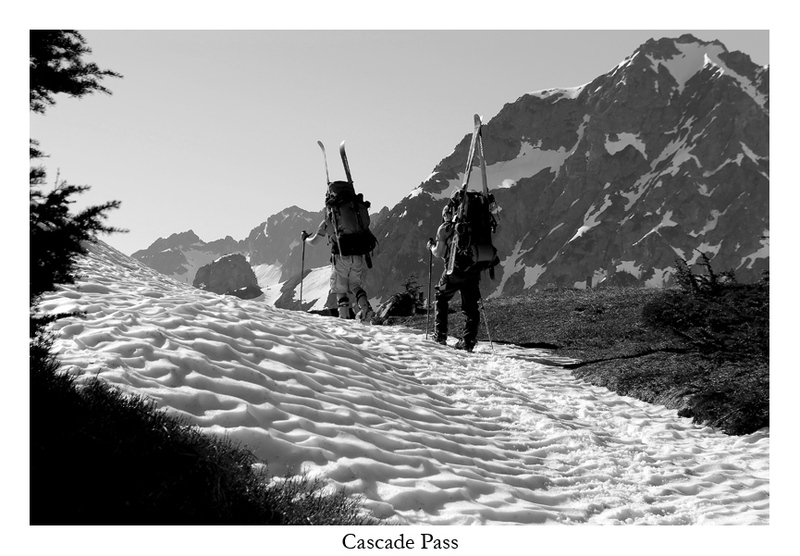 There is a direct way up to Cascade Pass that avoids the dozens (I've heard over 40) switchbacks. It can only be taken when there is plenty of snow, which I was happily surprised to find. We made poor route decisions through the slide alder. Little did I know how much harder it could honestly get? 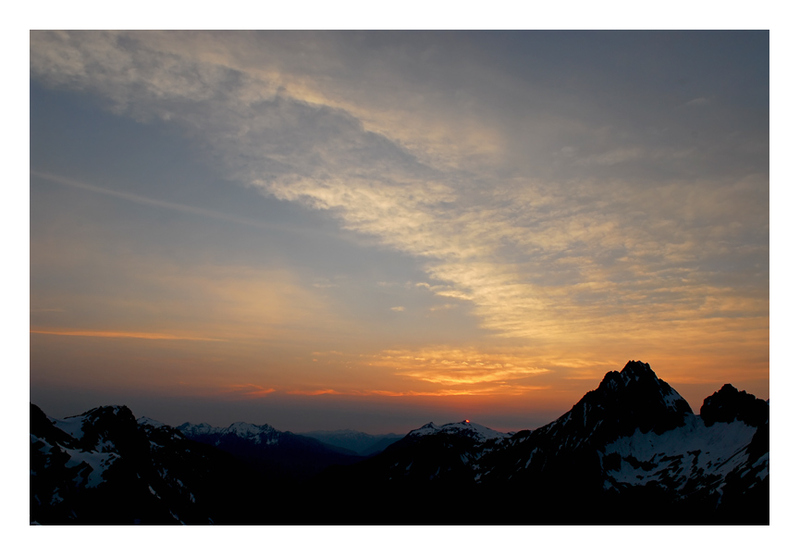 To think I was truly christened from all my adventures in the Cascades by all those approaches I'd endured. What an education I was in for come a week later when I would be making an escape toward Spruce Creek. We made good time up to the pass where we took a break and I named all the peaks for my brothers and showed them the way forward. 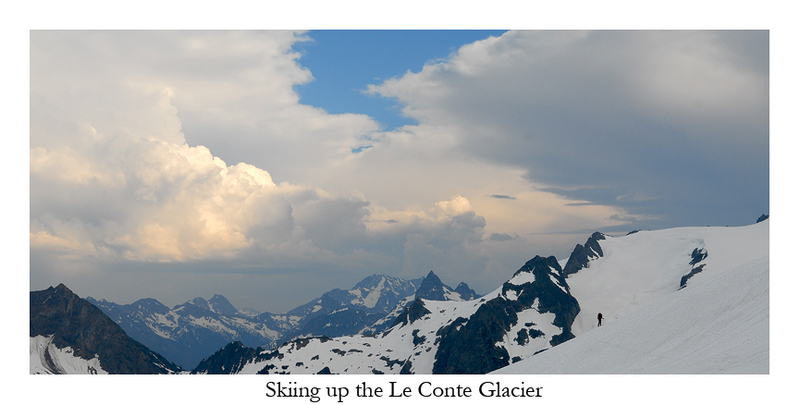 I convinced them that it would be best to climb high on the ridge and put our skis on for a quick traverse across. This worked beautifully! The snow was intimidating in the early morn where spots were icier than others. With such a heavy pack, it was daunting to make the crossing. I was sweating more from fear than effort. My brothers were big grins and smiles. I had taken a pair of skis I never use and one binding had loosened significantly and I hadn't noticed. Between fixing up a pair of my skis for Jessy (the ones I regularly use for myself), somehow I had played with the pair I ultimately used. His feet are much bigger than mine. This is not a place you want to have a slip up and with such a big pack, once I pushed off, I was not able to easily fix. Once done we put on crampons and quickly made our way up to a small rise above the Cache Glacier and continued up the ridge from there, as I knew a nice place to traverse would avoid so much dropping if you didn't climb up. By then the sun was facing us and we were getting our first tastes of the heat that would plague us for the next several days. I think that day it got over 100 degrees in town. 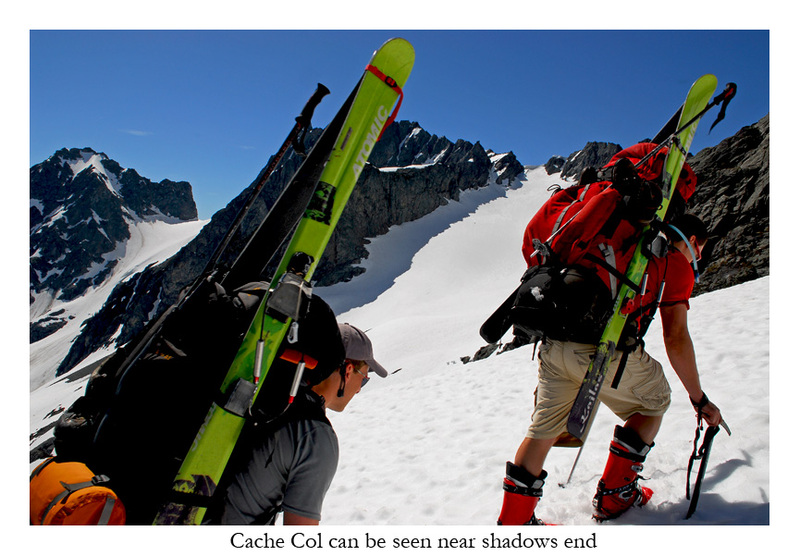 Beyond Cache Col you drop to Kool-Aid Lake and continue to Red Ledges. 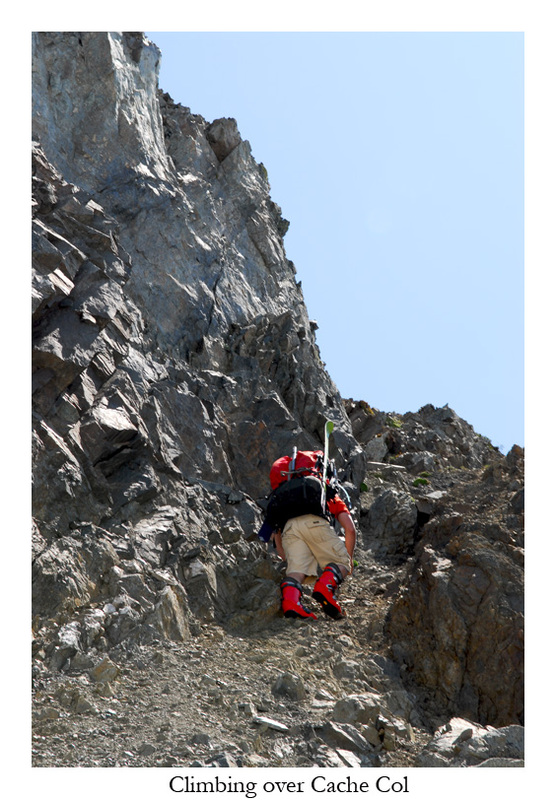 We decided on avoiding this route and instead climbed a steep chute to the ridge line below the standard route. By then the day's heat had increased to its warmest yet and we were absolutely dripping and every few feet I had to wipe my eyes out so I could see. The slope is over 40-degrees. I pushed hard for several hundred feet, as near to the point of exhaustion as I dared go, afraid of burning badly and too afraid to drop my pack to put on sunscreen. It was an incredible workout!!! At the top we decided to camp and enjoy our time remaining that day. 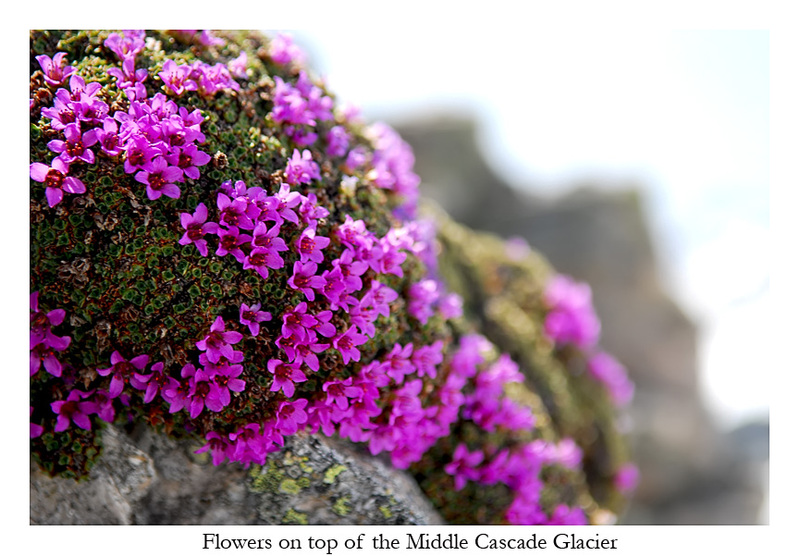 We certainly could've gone across the glacier and over to Spider-Formidable Col, but I pieced together the days anticipated schedule and we had room to stop, plus I was worked. I passed out with a half emptied pack on my mat surrounded by food. I didn't move for several hours. None of us did. The heat was impossible. Heads were covered with cloths and when that didn't work, I used my mat to block it. Most of my friends joke that Josh and I sweat so little. They should've seen me here. How I carried a pack and didn't just melt away, I don't know? I'd rarely felt such heat as this!!! Colors bloomed over Johannesburg that night and left us satisfied. Our first day over, we went to bed wondering what the next would offer. Morning was wonderful, even the late wisps of it that I captured. Desires to sleep had overwhelmed my desire to get up early for some pictures. Pretty soon we were on our way. 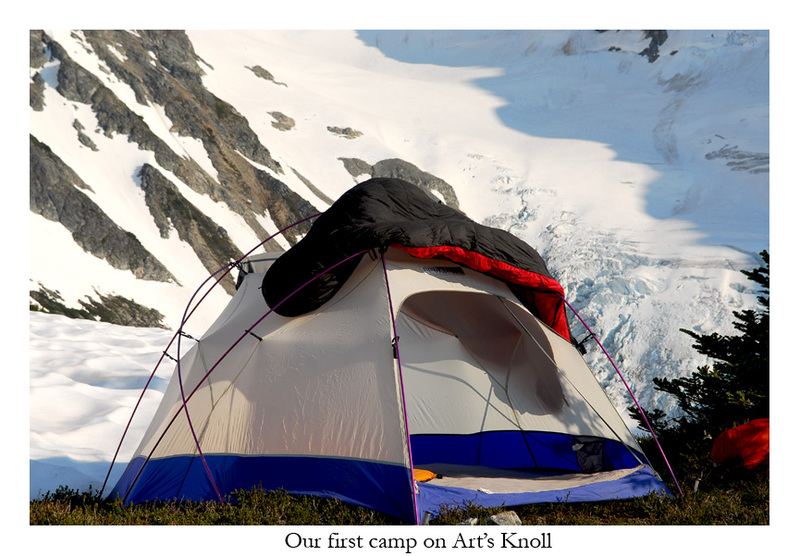 We first climbed well up Art's Knoll and made a ski traverse across the steep slopes down to the Middle Cascade Glacier. The snow was a bit icy but soft enough for us to easily stay on our feet. There were a few places to cross rock, most of which we skied across, but one required us to take our skis off and put them on our packs. Halfway across we realized that there would be no more downhill, so Josh and I climbed the snow and put on crampons while Jessy continued climbing the rock. Up at a nice stream with a small waterfall splashing into a moat, we crawled up onto the rock and took a break. It was a spectacular place for one. Views of Formidable and Spider were awesome. 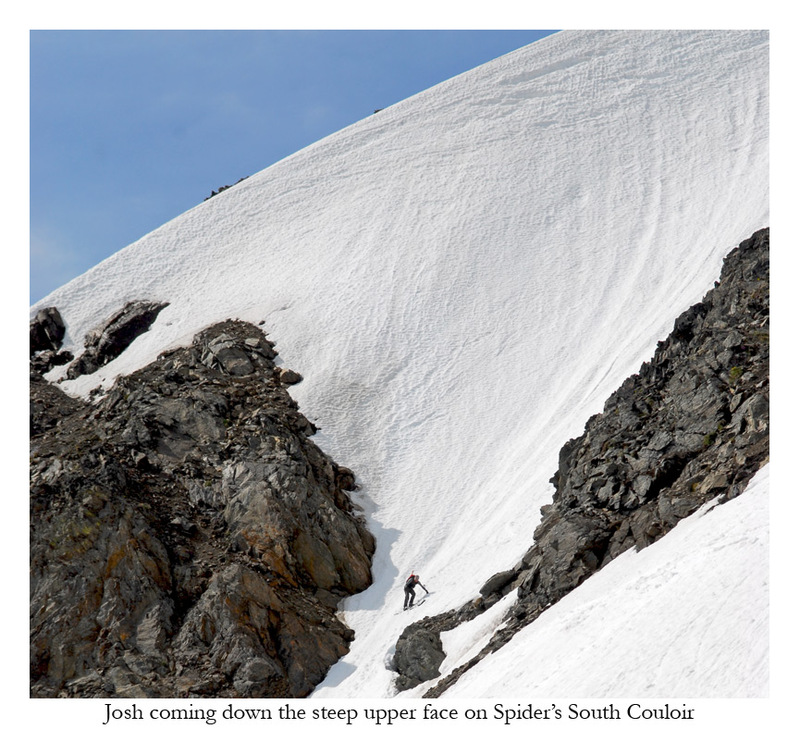 The glimpses I'd gotten of the North Face Couloir on Spider reminded me of my three failed attempts to ski it. I told Jessy how another friend of mine had taken 7 trips there before he skied it. 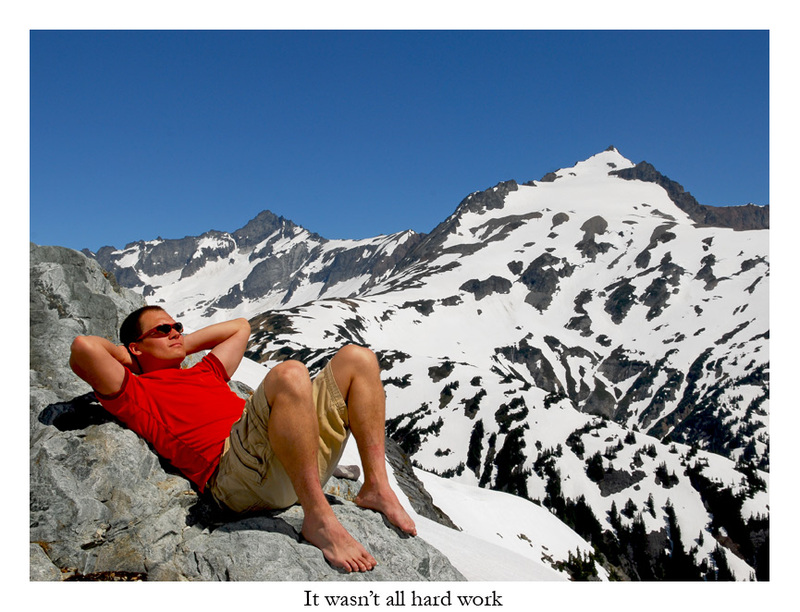 It was his goal to ski this peak in a day in winter. 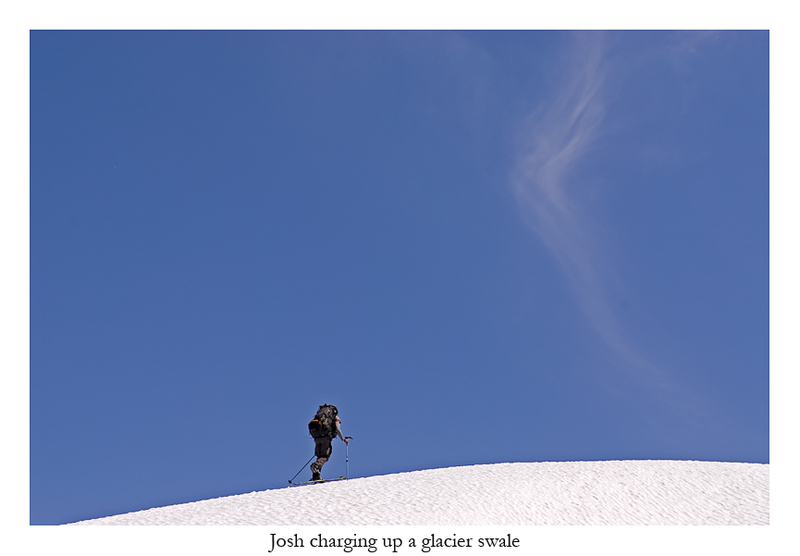 It eventually took him three and he fulfilled his angst for a single day's winter excursion on Formidable which he skied off the summit with his friend, Ross. A trip Josh and I bowed out of because we thought the weather was poor and the distance too much for one day. Sky still talks about the powder conditions he had and I think he considers this descent among his best. 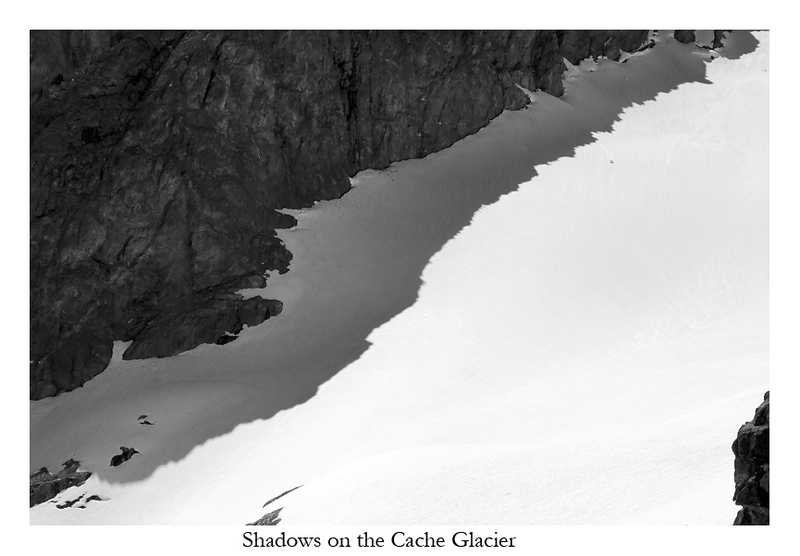 We climbed above the pass and skied over to it, this way avoiding the crevasses, however minor and traversing on foot. Here I remembered the pass on the right, but it was very steep and didn't look right. Side-stepping back out we scouted the other pass, which was much, much easier. It involved awesome snow and wonderful turns. Yay! It was about time. There was a lone goat far down the mountain, the only one we would see on the entire trip. 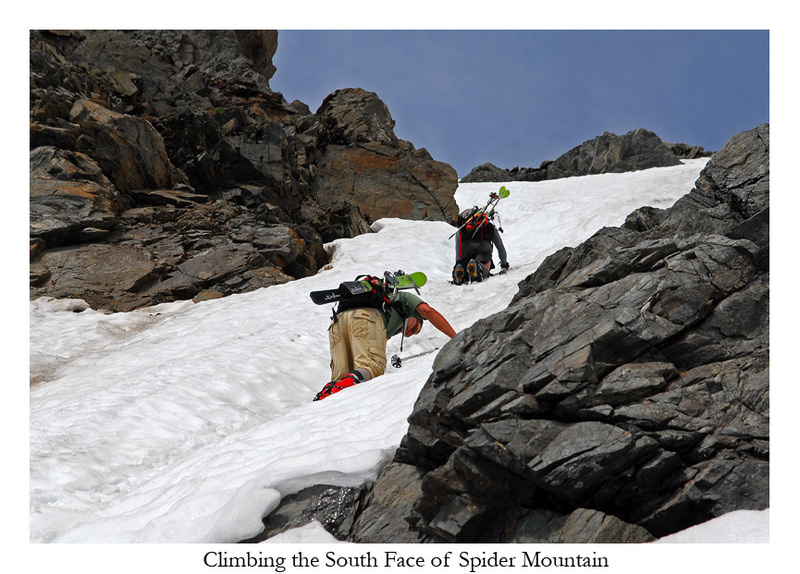 We decided after some discussion to go climb Spider Mountain via its South Face. I told Josh and Jessy that it should be a fantastic ski. The fact is I knew little about it. 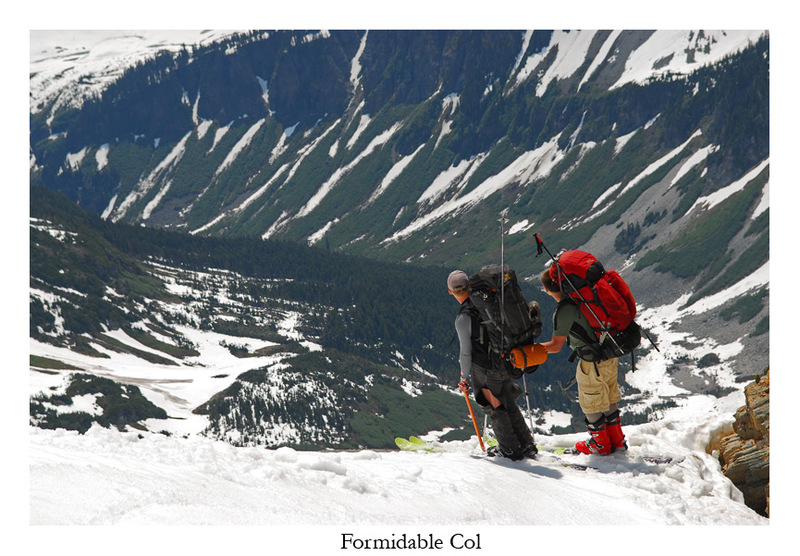 Once we dropped our packs and pulled our small daypacks out, we added skis, crampons, and axe before traversing over to the route. It turned out to be much further over than we thought and the entire time going up, we wondered if we were in the proper couloir. 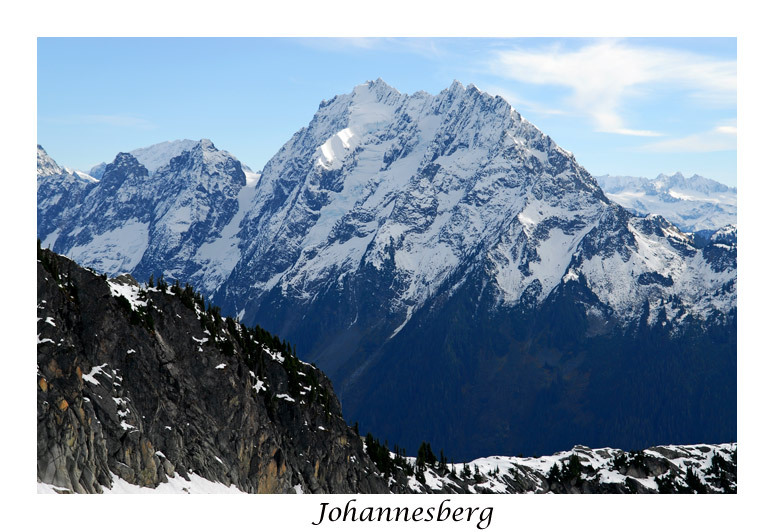 By July it was surprising any snow was on the route at all, especially considering it is south facing. The further we climbed, the steeper the route became, at one point pushing my comfort zone. It was over 50 degrees if we wanted to stay on the snow and not wide enough to turn. Once on top we enjoyed the view. We weren't sure which point was the true summit, but it didn’t matter much to us. We discussed which way to go. I began skiing down the route we climbed but thought it would be better to take Jessy on something easier. 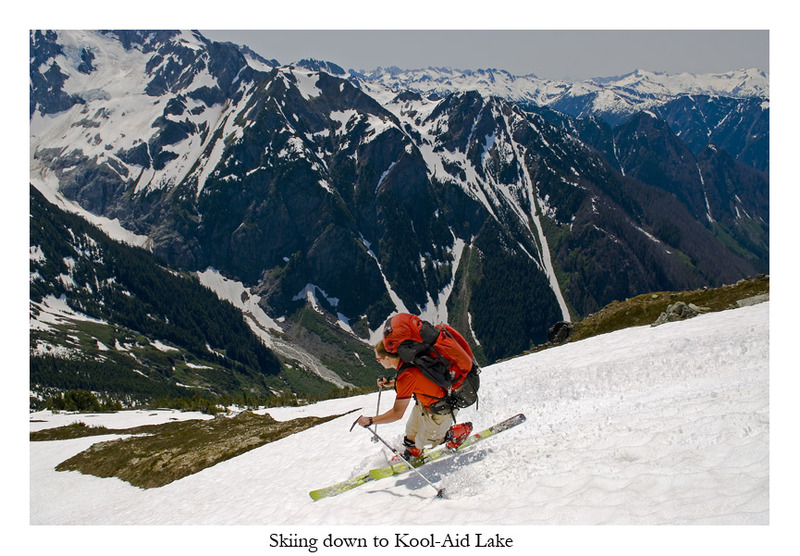 I had never taken him on a steep ski descent. He is naturally talented though and the climb was nothing for him. In the end, neither was the descent. He did better on the terrain than I did, which tends to happen with most things. Skiing down another route just left of our ascent was much easier and with more snow would avoid any of the steeper climbing that we did. 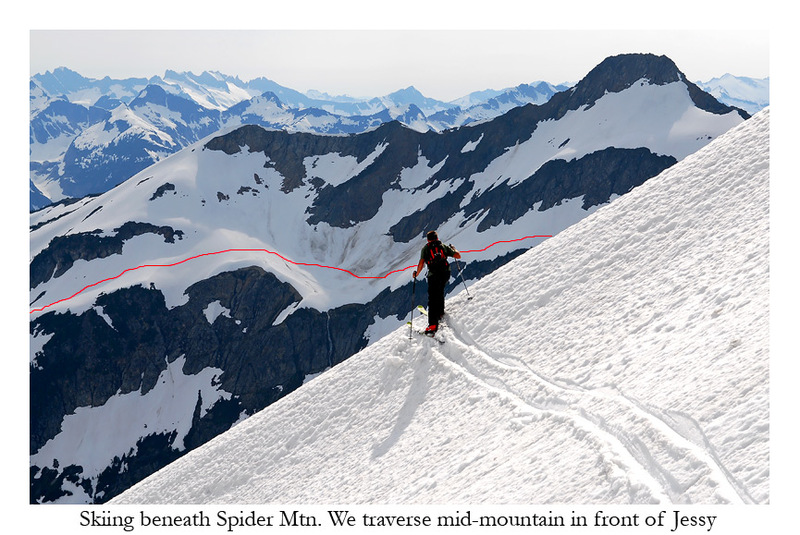 Also it would avoid the steepest skiing. Jessy and I scouted down this alternate route until it steepened considerably. 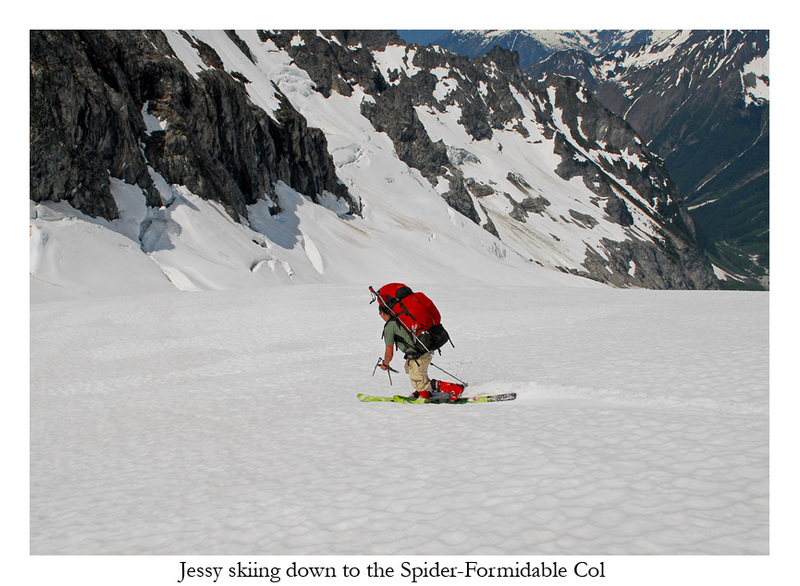 Jessy continued sans skis down on rock to a bluff overlooking the remainder of the couloir. My heart fell away when he said, "It ends in a giant waterfall". He's not one for exaggeration. Giant meant huge. Climbing back up we mounted our skis on our backs to climb back out, but the snow was deep and the thin snow sheltered many moats. Without a rope, I told Jessy that it may be better if we traverse to the other side on skis and then climb up or down from there. 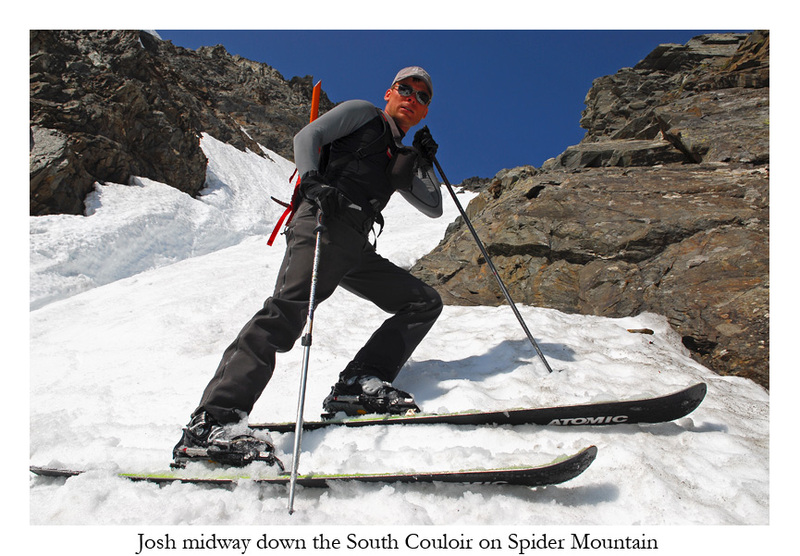 Meanwhile josh had skied over to the steep couloir and was making his way down. Jessy and I were enthralled to watch him ski gingerly through the tiny slot into the main couloir. His turns were mixed with copious sidestepping. He yelled that we should drop a little more and that we could cross 20-ft of rock and ski down from there. We had more wonderful turns, crossed the rock were I met Josh. By this time Jessy had flown away, pounding turns all the way to the bottom. I was impressed. It was steep, no fall territory. After several turns a large runnel blocked further progress, but the snow had become very, very good by then. We skied over and enjoyed awesome turns all the way to the bottom where we let out hollers of joy. Finally the beast was off my back. Four times I'd been in her arms and finally she lets me in. The skiing was awesome all the way to our packs. 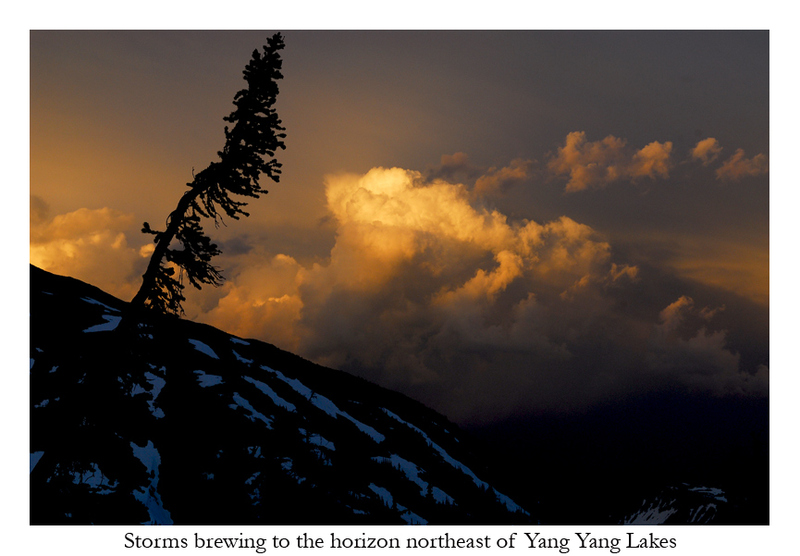 We loaded gear again and continued down to Yang Yang Lakes where we camped on the snow next to the lake. In hindsight I had wished we'd gone up to the ridge above the lakes, but now I know better for next time. Light blazed off of clouds that night in the brightest reds I've ever seen. I stayed with my camera until it was gone, most of the time appreciating its sharp, feral splendor. The storms carrying their fury burrowed into me and the billowing outlines so reminiscent of soft buoyant pillows were hard to imagine so full of fire and brimstone. That night I went to bed cursing them. In the morning I hoped for continued goodwill.